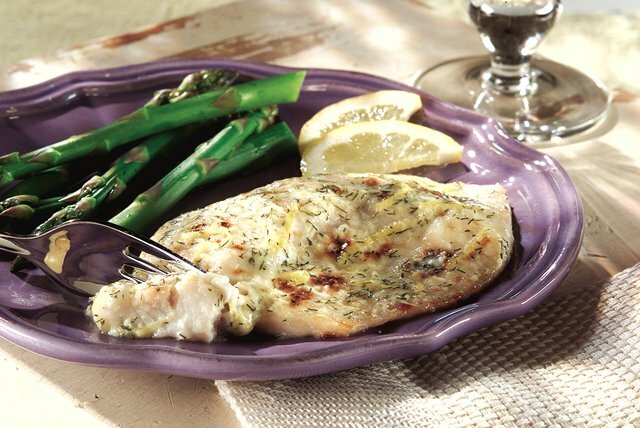 A simple but flavorful blend of mayo, dill, lemon juice and lemon zest makes an easy marinade for grilled fish. Preheat grill to medium heat. Mix mayo, lemon zest, lemon juice and dill. Place fish on greased grill grate. Brush with half of the mayo mixture. Grill 5 min. ; turn fish. Brush with the remaining mayo mixture. Grill an additional 5 to 8 min. or until fish flakes easily with fork. For more lemon flavor, increase lemon juice to 2 Tbsp. Preheat broiler. Place fish on rack of broiler pan; brush with half of the mayo mixture. Broil, 2 to 4 inches from heat source, 5 min. ; turn over. Brush with the remaining mayo mixture. Broil an additional 5 to 8 min. or until fish flakes easily with fork. Prepare as directed, using KRAFT Real Mayo Mayonnaise.